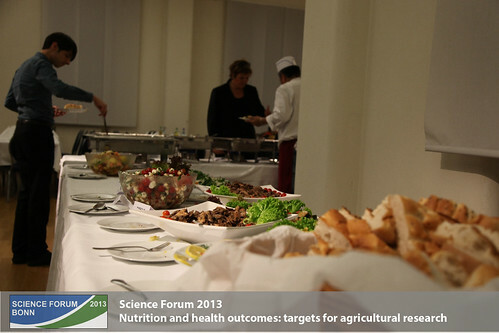 Within the unconventional setting of wild animals of the African Savannah and images of the foods of people all around the globe, the researchers and participants of the Science Forum were enjoying the conference dinner on Monday evening. Speakers, listeners and giraffesAfter being welcomed by a life-sized hippopothamus, and the opening words of Wolfgang Kasten, the audience, even though probably also very hungry, had to listen to the introductory words of Maggie Gill and the director Professor Wägele of the Museum König, within the padded versions of antelope, vulture and co. Professor Wägele reminded the guests that the place is an extraordinary venue for a conference dinner, as for once, on the very same floor the researchers are standing, the opening session of the German parliament after World War Two took place. Moreover, the Museum currently shows a photo exhibition on “What the world eats”. The pictures take the contemplator on a journey to 24 different countries with portraits of a 'typical' local family in front of their weekly food ratio. The pictures had been taken by Peter Menzel and Faith D'Aluisio. 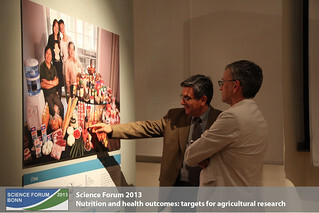 The exhibition was developed by the Alexander König- Leibniz Institute and Federal Ministry for Economic Cooperation and Development against the background of the upcoming Science Forum. The pictures impressively document the existing imbalances between regions of the world, between obesity and undernourishment, and at the same time connecting elements such as Kellog's Cornflakes. 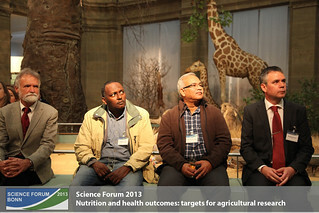 Through the insights on the tables of families around the world, topics like poverty and (hidden) hunger, as well as the influences of nutrition on the environment are made accessible to the public and discussions on them will naturally emerge. Finally, all the impressions gained could be taken to the table, where a regional meal containing carrots and beans, vegetable lasagne and salad, but only one meat dish was served.